Donald Trump and fellow Republicans are using rising premiums and departing insurers to renew calls to bury the U.S. president’s signature healthcare program. But they lack a viable alternative, meaning millions would lose coverage. Bipartisan surgery is a smarter option. 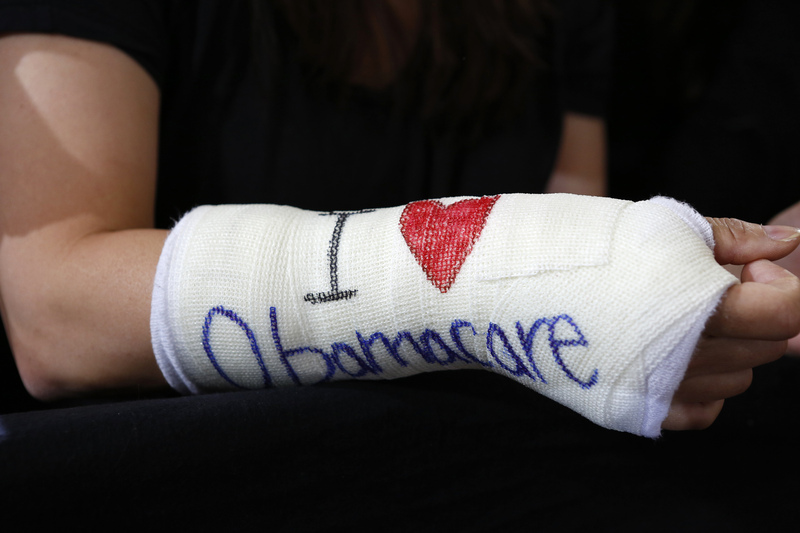 Cathey Park of Cambridge, Massachusetts wears a cast for her broken wrist with "I Love Obamacare" written upon it prior to U.S. President Barack Obama's arrival to speak about health insurance at Faneuil Hall in Boston October 30, 2013. Americans can start applying for 2017 insurance from federal healthcare exchanges on Nov. 1. The exchanges were created under the Affordable Care Act, generally referred to as Obamacare. They have until Dec. 15 to choose a plan, unless they can prove extenuating circumstances require an extension. The Obama administration had previously said that monthly premiums will go up by an average of 25 percent. Subsidies, though, can largely offset that increase for many people. Republicans have seized on both the price hike and the dwindling competition after several insurers pulled out of the scheme to claim Obamacare is a failure. GOP presidential nominee Donald Trump added yet more criticism in a speech on Nov. 1.